In general, the steroidal alkaloids represent an important class of alkaloids that essentially afford a close structural relationship to sterols i.e., they contain a perhydro-1, 2-cyclopentanophenanthrene nucleus. Interestingly, these group of alkaloids invariably occur in the plant kingdom as glycosidal combination with carbohydrate moieties. 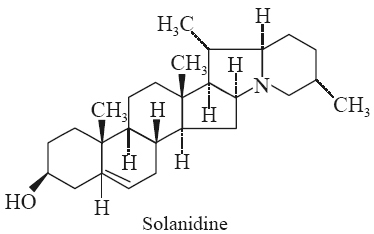 A good number of plants belonging to the natural order Solanaceae have been found to accumulate favourably several steroidal alkaloids based on a C27 cholestane skeleton, such as: solasodine, tomatidine, solanidine. These alkaloids usually occur in a wide variety of the genus Solanum, for instance: Solanum laciniatum; S. dulcamara Linn. ; S. nigrum Linn. ; S. torvum Swartz. ; S. lycopersicum Linn. ; (Lycopersicon exculentum Mill); S. tuberosum; S. aviculare etc. The three above mentioned alkaloids normally occur naturally in the plant as their corresponding glycosides. However, the two species of Solanum, namely: S. laciniatum and S. aviculare are considered to be a rich source of alkaloids (i.e., the aglycone moieties) that are employed exclusively as the starting materials for the synthesis of several hormones and adreno-cortical steroids. The solanum alkaloids, stated above are essentially the nitrogen-analogues of steroidal saponins. 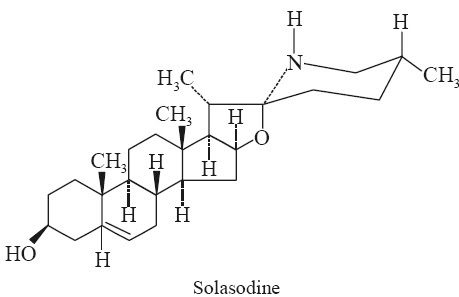 Unlike, their oxygen counterparts, all these N-containing alkaloids exhibit the same stereochemistry at C-25 (methyl being equatorial always), but C-22 isomers do exist, such as: solasodine and tomatidine. Isolation It is obtained by the hydrolysis of solasonine which yields solasodine, L-rhamnose, Dgalactose and D-glucose respectively. It is the dehydrated product. (i) It is obtained as hexagonal plates from methanol or by sublimation under high vacuum. (ii) It has mp 200-202°C; [α]D25 -98o [c = 0.14 in methanol); [α]D –113° (CHCl3); pKb 6.30. (iii) It is freely soluble in benzene, pyridine, and chloroform; moderately soluble in ethanol, methanol, and acetone; slightly soluble in water and practically insoluble in ether. 1. Dissolve 5-10 mg of the alkaloid in a few drops of hot amyl alcohol or ethanol and allow it cool gradually. The appearance of jelly-like product gives the characteristic test of the solanum alkaloids. 2. When a few mg of the alkaloids is treated with antimony trichloride solution in dry chloroform, it gives rise to a distinct red colouration. 3. The solanum alkaloids, in general, produces an instant red-violet colour with formaldehyde (HCHO) and sulphuric acid (H2SO4). This particular test is so distinct and sensitive that it is used for the quantitative estimation of these alkaloids colorimetrically. Uses It is invariably used as a starting material for steroidal drugs. Biological Source It is obtained from the roots of Rutgers tomato plant [Lycopersicon esculentum Mill., cultivar. “Rutgers”] (Solanaceae) (Tomato). Chemical Structure (3β, 5α, 22β, 25 S)-Spirosolan-3-ol; (C27H45NO2). 1. It is obtained as plates from ethyl acetate having mp 202-206°C. 2. It specific rotation [α ]D25 + 8o (chloroform). Identification Test Its hydrochloride derivative (C27H45NO2.HCl) is obtained as crystals from absolute ethanol having mp 265-270°C and [α ]D25 -5o (methanol). Biological Source The plant of Capsicum annuum L. (Solanaceae) (Chili, Peppers, Paprika) contains solanidine. 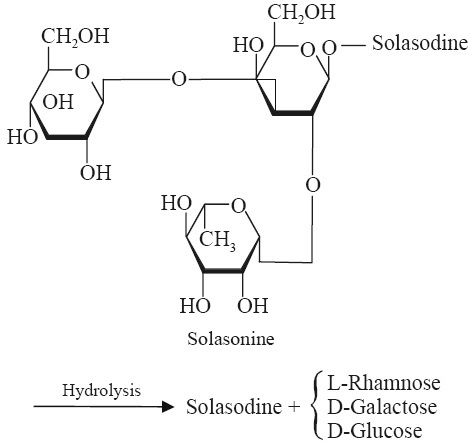 Isolation It is obtained by the hydrolysis of solanine which yields one mole each of L-Rhamnose, D-Galactose, and D-Glucose as shown below. 1. The long needles obtained from chloroform-methanol have a mp 218-219°C. It usually sublimes very close to its mp with slight decomposition. 2. It is specific rotation [α ]D21 -29o (c = 0.5 in CHCl3). 3. It is freely soluble in benzene, chloroform, slightly in methanol and ethanol; and almost insoluble in ether and water. (a) Hydrochloride Derivative: (C27H43NO.HCl): Prisms from 80% alcohol and gets decomposed at 345°C. (b) Methyliodide Derivative: (C27H43NO.CH3I): Crystals from 50% (v/v) ethanol and decomposes at 286°C. (c) Acetylsolanidine Derivative: (C29H45NO2): Crystals obtained from ethanol having mp 208°C. 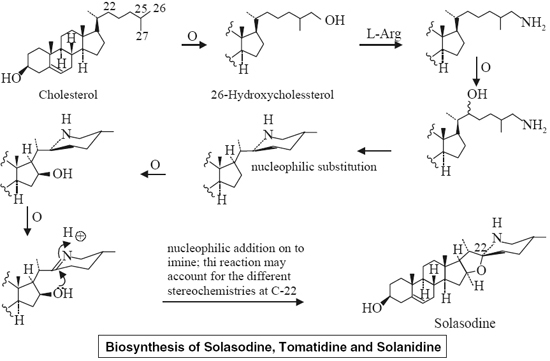 Biosynthesis of Solasodine, Tomatidine and Solanidine Like the sapogenins, the steroidal alkaloids are also derived from cholesterol, with suitable side-chain modification during the course of biochemical sequence of reactions as given under. 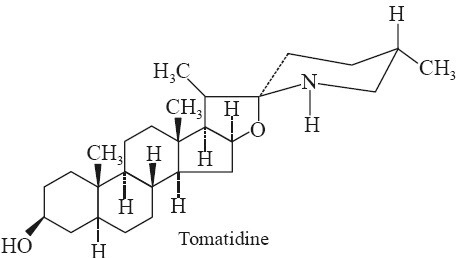 (iv) This specific reaction, however, establishes the configurations, viz: 22R-as in the case of Solasodine, and 22S-as in the case of Tomatidine. (A). Interestingly, one may observe in the structures of Veratrum alkaloids that the ring ‘C’ is a fivemembered ring while ring ‘D’ is a six-membered ring (B) which apparently is just the reverse of the pattern in the regular steroidal nucleus as depicted in next page. 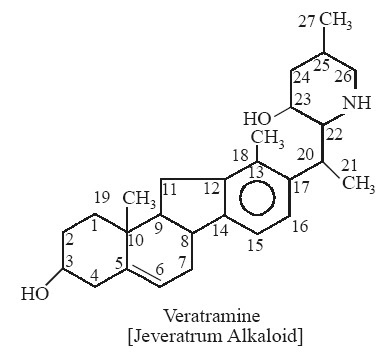 (a) Alkamine portion of the ester alkaloids of Veratrum, viz., Protoverine, Veracevine, Germine. (b) Alkamine aglycones of glycosidic veratrum alkaloids, viz., Veratramine. Biological Sources It is obtained from the rhizome of Veratrum album L. (Liliaceae) and Veratrum viride Ait. (Liliaceae) (American Hellebore). 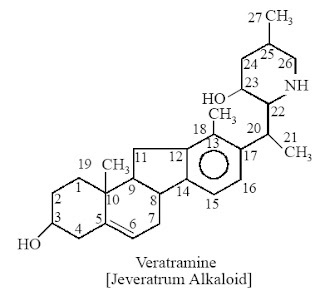 Group-‘C’: (Alkamines), germine, jervine, rubijervine, and veratramine. Isolation Protoveratrine A and B are usually extracted together and referred to as ‘protoveratrines’. About 2 kg of dried rhizomes of V. album is powdered and then extracted with benzene and ammonia. The total alkaloids are purified by extraction with acetic acid, re-extracted into benzene. The solvent is removed under vacuum, the residue is dissolved in ether from which the crystalline powder of the crude protoveratrines separates out. The crude product is recrystallized from alcohol-acetic acid and upon subsequent alkalinization of the solution with dilute ammonia. By this method one may obtain 8-10 g of protoveratrine powder from 8 kg of V. album rhizomes. Consequently, protaverine A and B may be separated by the help of counter current distribution of the “protaverine” between benzene and acetate buffer (pH 5.5) and ultimately subjected to column chromatography on acid aaluminium oxide (Al2O3). (i) The sternutative crystals obtained from ethanol have a slightly bitter taste. (ii) It decomposes at 266-267°C. (iii) Its specific rotation [α]D25 -38.6o (pyridine), and [α]D25-85o (C = 1.99 in chloroform). (iv) It is soluble in chloroform, dilute aqueous acidic solutions and slightly soluble in ether. It is practically insoluble in water and petroleum ether. receptors in the heart and carotid sinus. 2. It also possesses emetic action. 3. It is used in the treatment of toxemia of pregnancy. * Blount, J. Chem. Soc, 122, (1935); Vejdelek et. al. Chem. Listy 153, 33, (1956); Coll. Czech. Chem. Commun., 22, 98 (1957). Biological Sources It is obtained from the seeds of Schoenocaulon officinale (Schelecht. And Cham.) A. Gray and also from the rhizome of Veratrum album L. (Liliaceae). Chemical Structure (3β, 4α, 16β)-4, 9-Epoxycevane-3, 4, 12, 14, 16, 17, 20-heptol 3-(3, 4-dimethoxybenzoate) as given under. 1. It is yellowish-white amorphous powder. 2. It tenaciously retains water. 3. It has mp 180°C after drying at 130°C. 4. Its specific rotation is [ α]D20 +8.0o (ethanol) and pKa 9.54 ± 0.02. 5. It is insoluble in water but slightly soluble in ether. 1. It readily forms its nitrate derivative which is an amorphous powder and sparingly soluble in water. 2. Its sulphate salt is formed as its needles which happens to be very hygroscopic. 3. It readily forms its perchlorate derivative as long needles from water having mp 259-260°C (after drying at 120°C in Vacuo). A. Gray (Sabadilla officinarum Brandt.) belonging to family Liliaceae. Chemical Structure [3β(Z), 4α, 16β]-4, 9-Epoxycevane-3, 4, 12, 14, 16, 17, 20-heptol 3-(2-methyl-2-butenoate) as stated below. 1. It gives rise to flat needles from ether which decomposes at 213-214.5°C. 2. It has specific rotation [α] D20 +12.8o (C = 3.2 in ethanol). 3. Solubility: 1 g dissolves in 15 ml ether or ethanol and is very slightly soluble in wager. 1. It forms aurichloride derivative which are obtained as fine yellow needles from ethanol that gets decomposed at 190°C. 2. It readily produces mercurichloride derivative (C32H49NO9.HCl.HgCl2) as silvery scales which decomposes at 172°C. 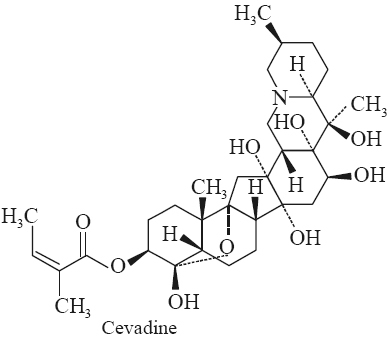 Caution Cevadine is extremely irritating locally particularly to the mucous membranes. Caution must be used in handling. Biological Source Germine (an alkamine) is present in a plethora of polyester alkaloids that occur in Veratrum and Zygadenus species, such as: Veratrum viride Ait. (Liliaceae). Chemical Structure (3α, 4α, 7α, 15α, 16β)-4, 9-Epoxycevane-3, 4, 7, 14, 15, 16, 20-heptol (C27H43NO8). 1. It is obtained as crystals from methanol mp 221.5-223 C°. 2. It has specific rotation [α]D25 +4.5o(95% ethanol) and [α]D16 +23.1o (C = 1.13 in 10% acetic acid). 3. Solubility: It is soluble in chloroform, methanol, ethanol, acetone and water; and slightly soluble in ether. 1. 3-Acetate derivative of Germine (C29H45NO9): It forms needles from ether having mp 219-221°C and [α]D23 +1.0o(C = 1.05 in pyridine). 2. 16-Acetate derivative of Germine (C29H45NO9): It forms crystals from chloroform having mp 225-227°C and [α]D23 -19o (C = 0.93 in pyridine). 3. 3, 4, 7, 15, 16-Pentaacetate derivative of Germine (C37H53NO13): It yields prisms from acetone + petroleum ether which decomposes at 285-287°C and [α]D23 -65o(C = 0.65 in pyridine). Biological Sources It is obtained in the rhizomes of Viratrum viride Ait. (Liliaceae) (American Hellebore); and also from Veratrum grandiflorum (Maxim.) Loes. F. (Liliaceae). 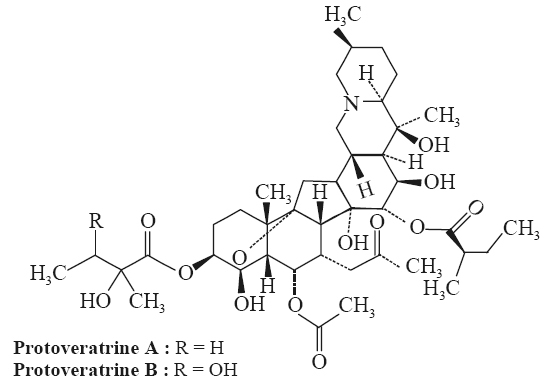 Chemical Structure The chemical structure of veratramine has also been referred to as azasteroid, wherein the N-atom is present is in one or more side chains. (3β, 23β)-14, 15, 16, 17-Tetrahydro-veratraman-3, 23-diol (C27H39NO2). 1. It is obtained as crystals having mp 206-207°C. 2. It is slightly soluble in water, but soluble in ethanol and methanol. 1. It forms a complex with digitonin (1:1) that has uvmas : 268 nm and [α ]D25 -71.8o (C = 1.21; [α ]D25 -70o (C = 1.56 in methanol). 2. Dihydroveratramine Derivative: The crystals of dihydroveratramine derivative has mp 192.5- 194°C ; [α]D25 +26o(C = 1.26 in acetic acid). Biological Sources It is obtained in the rhizomes of Veratrum grandiflorum (Maxim.) Loes F. Veratrum album L., and Veratrum viride Sol. (Liliaceae). 1. The needles obtained from methanol and water has mp 243.5-244°C (Saito). 2. Its specific rotation [α]D20 150 - ∞ (ethanol) (Saito); and [α]D20 -167.6o (chloroform) (Poethke). 3. It has uvmax : 250, 360 nm (€ 1500, 60). 1. Diacetyljervine (C31H43NO5): The diacetyljervine has mp 173-175°C; [α]D – 112°; uvmax (ethanol): 250, 360 nm (€ 16400, 80). 2. Jervine Hydrochloride has mp 300-302°C. Biological Sources It is obtained from the rhizomes of Veratrum viride Ait (Liliaceae) (American Hellebore); V. album L. (Liliaceae); and V. eschscholtzii Gray. (Liliaceae). 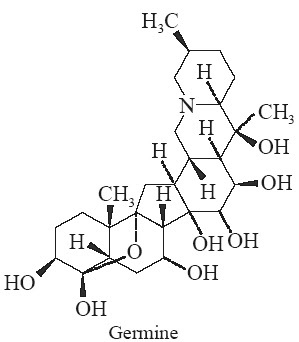 Chemical Structure It is the glucoside of jervine as given below. (3β, 23β)-17, 23-Epoxy-3-(β-D-glucopyrnosyloxy) veratraman-11-one. (C33H49NO8). 1. It is obtained as lustrous leaflets having mp 300-301°C (dec.). 2. It specific rotation [α]D25 -133o (C = 0.48 in 1.3 ethanol-chloroform). 3. Solubility: It is soluble in benzene, chloroform; slightly soluble in ethanol and almost insoluble in ether. 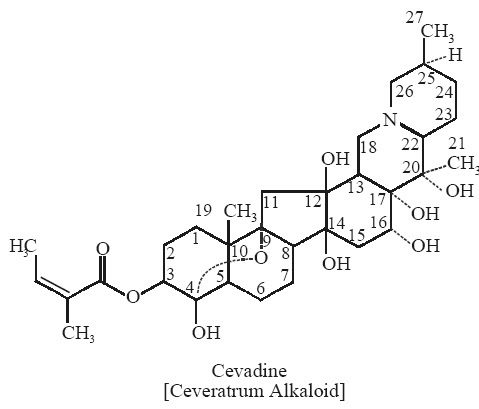 Note: It is, however, pertinent to observe here that the Zygadenus species and the Schoenocaulon species appear to have only the Ceveratrum alkaloids and practically no Jeveratrum alkaloids. 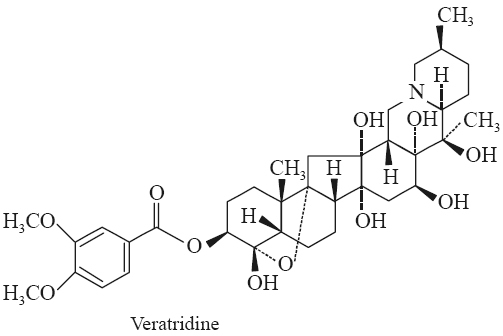 Interestingly, the large number of Veratrum species seem to contain both these type of steroidal alkaloids.